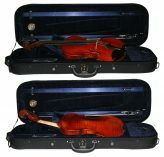 The Krutz 450 Violin Outfit is a new product to Violin Outlet. We have set it up as a special outfit with an oblong case and carbon violin bow. 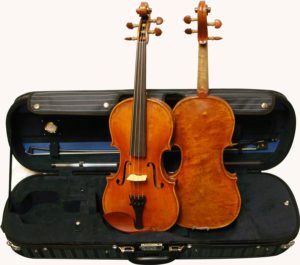 This beautiful violin is made with a well-seasoned spruce top, seasoned and highly flamed maple back, ribs and scroll, 1 piece back, inlaid purfling, acoustically enhanced wood sealer, and an antique oil varnish. Krutz 450 violins are set up in the Kansas workshop of Krutz Strings with Thomastik Dominant or equivalent strings. Case may vary. Store stock is limited. Instruments may be drop-shipped from the manufacturer. Tailpiece may vary.